This summer, keep your home cool and comfortable with a new A/C system from Sherman Oil. Whether you choose to cool your home with a central air conditioning system or a ductless mini-split system, our trained technicians will expertly install your cooling system or make any needed repairs to an existing system so that you can enjoy the benefits all summer long. With years of experience and knowledge, let our team help you figure out which system will be the best fit for your home. We’ll discuss the benefits of the different systems and find the right match for your personal cooling needs. 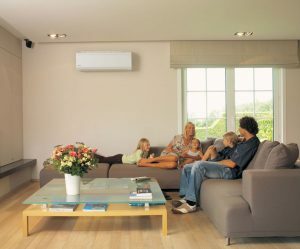 No matter which system you choose, you’ll enjoy the greater efficiency and lower energy bills! View our recommended systems and then contact us to schedule a consultation today! Whether your A/C system requires a minor repair or a major overhaul, give our technicians a call. We provide expert A/C maintenance at the right price to keep your system running effectively and efficiently during the hottest days of the year. Request service for your system and we’ll get back in touch with you shortly to set up your appointment.